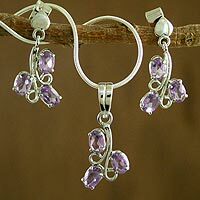 Amethyst buds blossom on argent vines creating a vision of mystical beauty. Amethyst is credited with being a highly spiritual gemstone. From India's Alok Jain, the lilac stone is set on sterling silver encasings to create a jewelry set of stylish chic.